How much discount? | What Car? 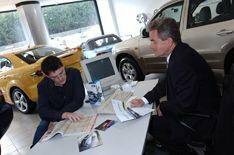 Q) Generally speaking, how much should I expect to save on the list price of a new car? Is a 10% discount reasonable? I'm looking at several cars with a list price of around 20,000. A It all depends on the car. You'll be lucky to get any money off desirable models, such as the Alfa Romeo Mito. On the flipside, you can probably save at least 16% on the price of a Ford Focus. What Car? 's Target Price for every new car is available on this website. Target Price is the maximum you should consider paying for a new car, so there's no reason why you can't haggle an even bigger discount.